The Internal Affairs Division of the San Francisco Police Department is investigating a Sunday incident caught on tape that appears to show a police officer almost pushing a man out of his wheelchair, SFGate reports. Acording to the report, around four police officers were standing on a street corner responding to an incident pertaining to disorderly conduct when the wheelchair-bound man rolled to the corner and exchanged words with the officers. In the video, it appears that the officers instruct the man to leave the street corner, and at one point an officer repositioned the man’s wheelchair in an apparent attempt to get the man to leave. 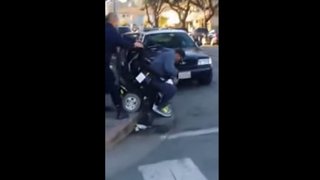 Soon, an officer can be seen almost tipping the man out of his wheelchair. “At one point, one of the officers appears to try to tip over the man in the wheelchair, then push him off the curb,” SFGate reports. An onlooker, who was filming the entire incident, can be heard telling the wheelchair-bound man not to go near the corner. Then, when the tipping begins, the onlooker runs toward the man to prevent him from falling over. “The video records the officer saying the man in the wheelchair ran over his foot,” SFGate explains. More words were exchanged among the officers, the wheelchair-bound man and onlookers, and then the video ends.